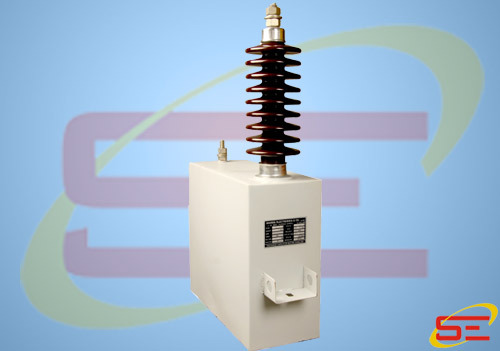 We are Manufacturer & Exporter of Surge Absorbing / Protective Capacitor. This product is used to protect generator and heavy motor from intern fault. SHARDA’s surge protection capacitors are special types of capacitors. Its application is of a specialized nature i.e. in case of abnormal condition. These capacitors are designed for protection of large rotating machines such as motors & generators. At the time of over voltage during electric storms produces surges to electrical equipment’s connected to system. The voltage stress between turns of multi turn coil sets a limitation and surge voltage causes breakdown between turn to turn insulation resulting in short circuited turns. To protect from this situation surge capacitors are used. These capacitor compliance with ISS std. 11548:1986. • Protection of Motors and Generators against Inter-Turn fault. • High voltage Surge & Cable fault finding.